Submitted by Fred on Thu, 09/25/2014 - 5:06pm. 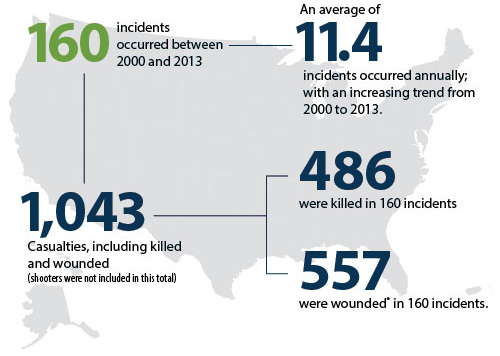 Today the FBI has released a study of 160 active shooter incidents that occurred between 2000 and 2013 throughout the U.S. The primary purpose of the study? To provide our law enforcement partners—normally the first responders on the scene of these dangerous and fast-moving events—with data that will help them to better prepare for and respond to these incidents, saving more lives and keeping themselves safer in the process. But we believe the information contained in this study can benefit anyone who could potentially be in an active shooter situation—like emergency personnel, employees of retail corporations and other businesses, educators and students, government and military personnel, members of the general public, etc.—by giving them a better understanding of how these incidents play out. We began the study in early 2014. With assistance from Texas State University’s Advanced Law Enforcement Rapid Response Training Center, we researched possible active shooter incidents in the U.S. during our selected time frame using official police records, after action reports, and shooting commission documents as well as FBI resources and open source information. We identified 160 events that fit our criteria—individuals actively engaged in killing or attempting to kill people in populated areas (excluding shootings related to gang or drug violence). Using the results of this study, the Bureau’s behavioral analysis experts will now delve deeper into why these shooters did what they did in an effort to help strengthen prevention efforts around the country. Today’s study is just one of the resources the FBI offers to its law enforcement partners and others to help coordinate and enhance the response to active shooter incidents. Other resources—due in part to last year’s Investigative Assistance for Violent Crimes Act and a federal multi-agency initiative targeting violent crime—include training for first responders, conferences for law enforcement executives, operational support in the event of an active shooter event, and assistance to victims. The Bureau is in a unique position to offer this type of assistance—we’ve played a large role in supporting the response to every major active shooter incident in recent years.